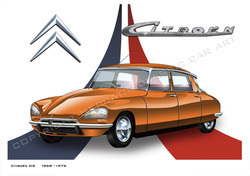 Hepcat's Classic Car Art - original prints of Jaguars, MGs, BMWs, Fiats, & other 1960s classics! Background badges for 3.8, 3.4 or 2.4 versions. 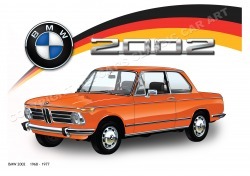 Available in classic BMW colours - Inka Orange, Sahara Beige or Jade Green. 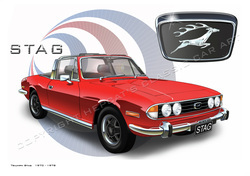 Available in classic seventies colours - red, blue, beefy yellow or British Racing Green. Available in black, grey and red, all other colours available at no extra cost, just ask! want, at no extra cost! Click for more details. Available in red, sky blue or British Racing Green. Available in red, silver or British Racing Green. Available in red at this stage, more colours soon. your exact car for a small additional fee. Numberplates, colours, etc are all customisable. Please contact me for details. cheeky yellow or creamy white. 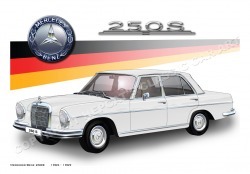 280SE or 280SEL, in white, red, blue or grey. 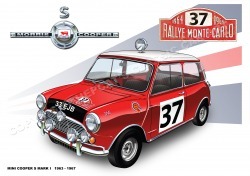 Available as the 1964 Rallye Monte Carlo winner driven by Paddy Hopkirk, and standard non-rally versions available in red, blue and British Racing Green. in any colour you want, no extra charge! Either 1960s Oval Window or later 1970s version - click image to see more! I illustrate classic cars from the 1960s - Jaguars, MGs, Fiats, BMWs, Alfa Romeos, Citroens and Minis to name just a few. My original illustrations are available as limited edition prints, priced at US$32 each including postage to anywhere in the world. Please click on any of the images on the left to see more info about that print or to purchase it. 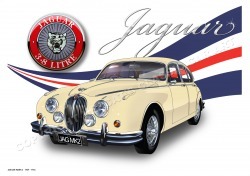 If you require a personalised bespoke, one-off artwork to replicate a particular car (e.g. a different colour, a specific numberplate, the addition of accessories such as wire wheels or foglights) this can be arranged at an additional cost. Please contact me for a quote on a bespoke artwork for a truly personal gift. Follow me on Facebook or Twitter to receive regular updates on promotions, upcoming illustrations, and general classic car news. I am a full member of the following car art guilds. Check out the Workshop to see how the latest classic car pic is coming along. and get an idea of all the layers and work that goes into each artwork. Simply click on any of the pics below to see the car in detail. On that car's page, just click the yellow "PURCHASE" button - this will take you to a secure online order page where you can select your model and colour choice. Once you have made your selection, secure online payment through Paypal can then be confirmed. Full colour litho print on archive quality A3 paper, measuring 420mm wide by 297mm high (16.5 x 11.7 inches). 260gsm stock. Unframed. 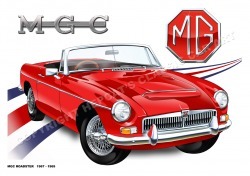 Each print is physically embossed with the Classic Car Art logo in the bottom right corner, as well as hand signed and numbered by the artist. Please note: the text watermarks on the images on this website are to prevent unauthorised use of these images. The actual prints do not, of course, have any such watermarks on them. I am a professional graphic artist, as well as a classic car enthusiast. I own a 1968 Jaguar 240, which served as the basis for my first original illustration. Each digital illustration takes about 40 hours. Check out my Workshop to see how it all comes together. I make sketches from real life examples, and then digitally illustrate the original drawing and colour, finally refining the image with photo manipulation software to give more realistic effects such as the reflections in the paint and the sunlight on the windscreen. Each image is made of many layers: typically a background layer, with additional layers for tyres, bodywork, interior, chrome, reflections, dark shadows and highlights all superimposed successively on top. 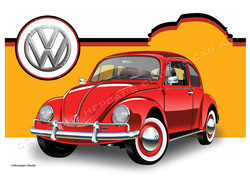 All images are copyright Hepcat's Classic Car Art. Unauthorised reproduction is prohibited.